Come experience pristine Squam Lake in a way that is personalized to your liking. Bask in the sun or stay shaded under the boat's canopy. Zoom fast around the lake or putter along. Anchor in quiet coves or off sandy beaches, swim or jump off the boat. Be daring and jump off infamous "Jumping Rock". View wildlife, tour historic Church Island and On Golden Pond movie sites. Stroll along a boarded swamp-walk or pick native blueberries in season. Cruise at sunset, or star gaze under a full moon. 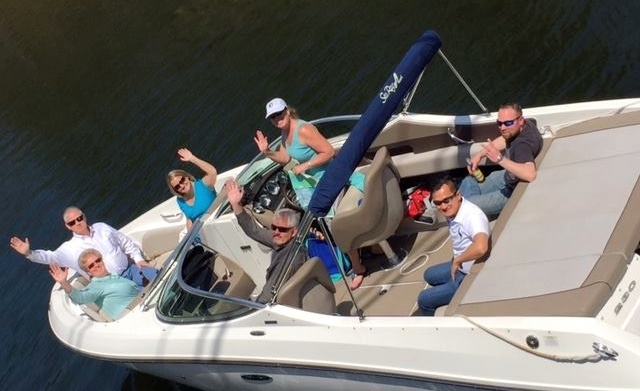 With a lifetime of experience on Squam Lake, we have various excursions put together depending on you and your groups preference or we can custom tailor an experience to meet your specific needs. We offer a variety of services from weddings, to team building, water fitness, production and shuttles. If you don't see a specific service, ask we can usually accommodate it.